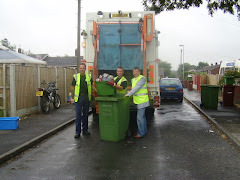 Week two and a change of bins to go out with it being green waste and residual waste this week. Quite surprised at the amount of waste in the residual bin as we have four adults in the house plus the kids boyfriend and girlfriend and there was still less than 3/4 of the bin filled even after two weeks. Now looking at ways to reduce the actual amount of plastics we bring into the house in the way of soft drinks etc. but its not as easy here as it is in the States where you can take your old bottles back and get them refilled at the supermarket. Cans are OK but it does make it a lot more expensive especially with a couple of soft drink sponges like I have in the house. Also looking at packaging in general and we have now stopped using plastic bags from the supermarket completely with fair trade hessian bags now called into use for the weekly shop. The only concession to this is if we shop online and have it delivered but even then we send the bags back to the supermarket. Welcome to my online diary where I will talk about mine and my family's attempts to become greener and help the Wakefield district continue to be a place we can all be proud of. I am currently the Cabinet Member responsible for Environment with Wakefield Council and have been a councillor for eight-and-a-half years. The Wakefield district has so much to offer and I'm a strong believer that if we all work together, take pride in our places and say no to litter and waste, we can strengthen the area as beautiful place to live, work and visit. One of my main aims is to help to put the spirit back into community.